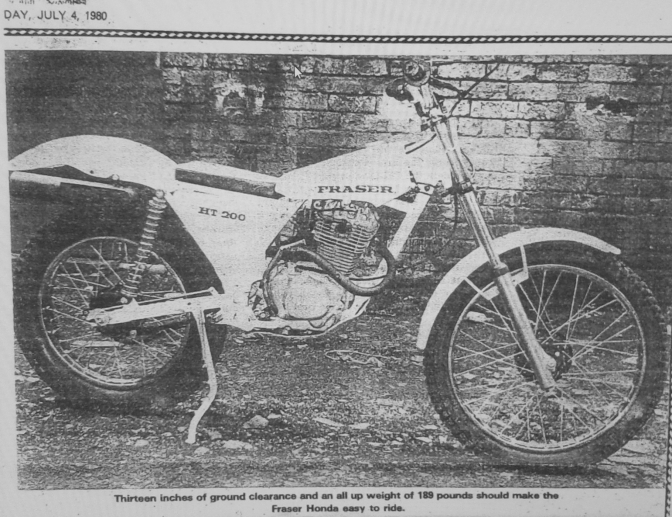 We thought we would research in to the history of the Frazer Honda being a little known breed of bike back in the eighties. 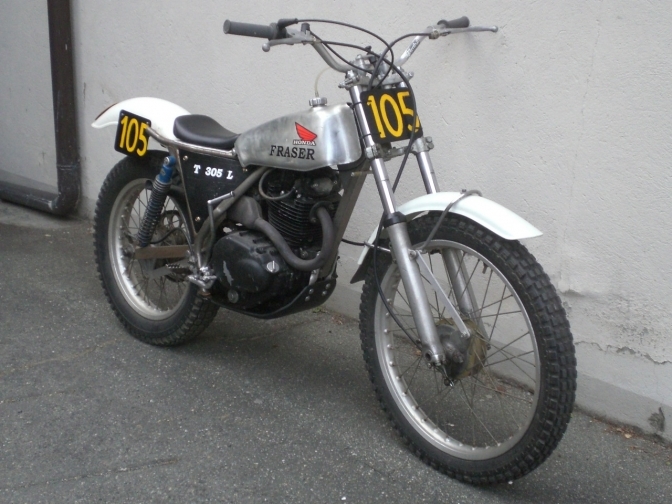 "The Fraser Honda trials bike". Photo Courtesy Justyn Norek Snr. After a load of research we did in 2014, we could not find out anything specific about this machine. So information of any type would be of value. With Colin Tipping being no longer with us, it is very difficult to find any information, and company records don't show up for "David Fraser Products". So It is you guy's that have the machines, to give us information. 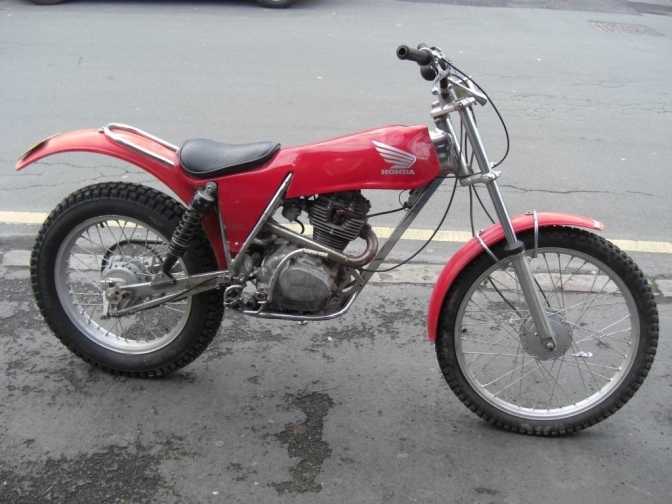 I do know there were a couple of bikes built with a swinging arm lay-shaft drive to the back sprocket. picture later when I find it on the computer. The frames were basically built using ERW tubing round and square and rectangle in section. The swinging arms seem to have been a problem built using rectangle tube. And bending badly under torque from the engine. As I say the information on these machines is very sparse. I feel that the makers were not the favourites with the press at the time so the stories never got written. Various engines were fitted into these by "David Fraser Products." But you can see they were a good machine. 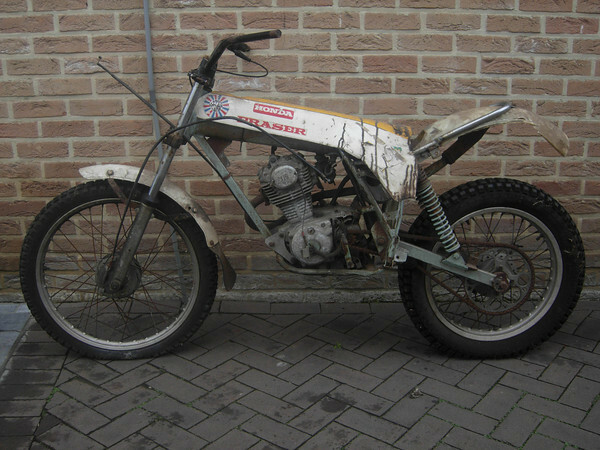 This is Carlo's Fraser Honda that Justyn has tested. And a shot of the other side. Trial's machine collector and lover! 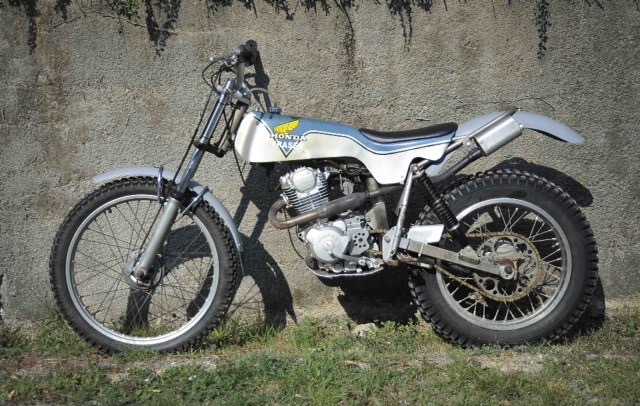 I think that the machines rebuild now, to looking a Classic trial,are not "Classic" but "Special"
Because they are a new machines,with Classic look (they mean a Classic from 10 meters,but,when you are near,you can see that they are a"modern" machine..
Charlie,> I totally agree with you. But how do we stop persons building modern bikes to there mind, "look like bikes" from the time. But not fulfilling a rebuild of a period bike to the same specification as that bike that came out of the factory. And we all know that this is possible without making the improvements. So if any of you have any information about these machines let me know and we will dedicate this page for these bikes. And these were built in the eighties, and not copies built today. These were a true cottage craft industry. built on a love of the sport and not designed to destroy it. and in his head thought that he could take over where Honda left off. What do you think? we all have dreams. And it is proven that Colin made very little money out of building this brand of machine. As it seems to me to be a lot like when I started researching the BSA “Otter”. So we keep finding more. Here is one of the Three? 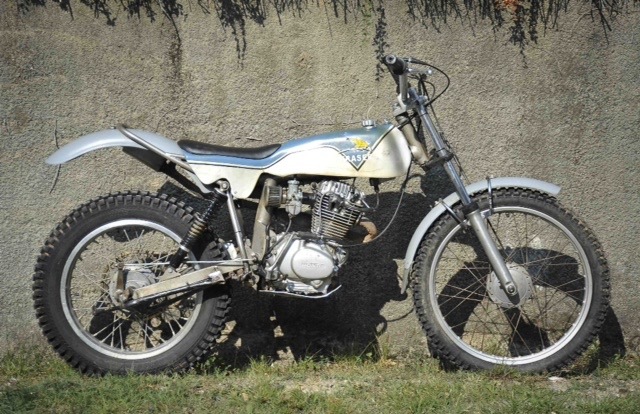 HT 250 machines. 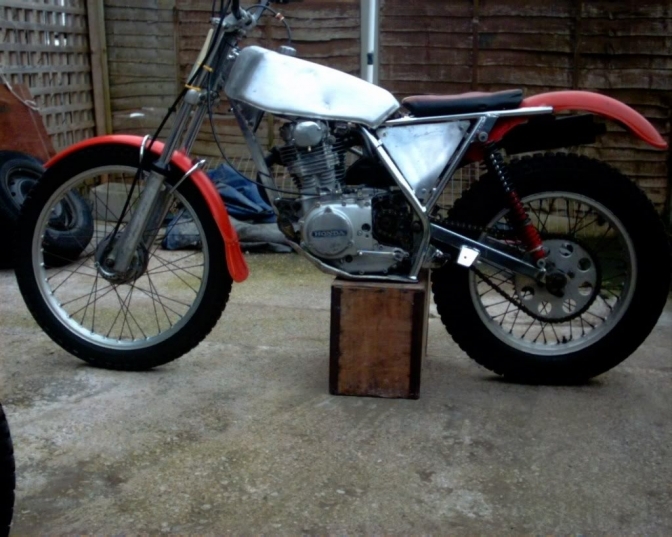 Every one of the builds that Colin took on was different, most of them with engines bored out to take a bigger piston and about 305 cc. The guy just liked creating something different. This is Callum Robertsons bike. 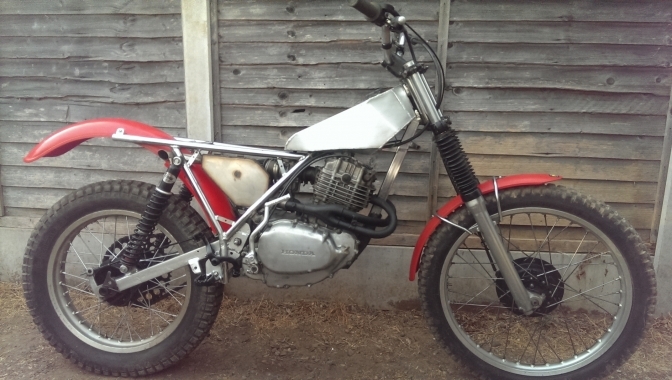 And the other side of Callums Smart Fraser Honda HT 250.
thanks for sending me the two photos Callum. And Callum says there is a third HT 250 machine out there, Do you know where it is? Well we do now and even a fourth. 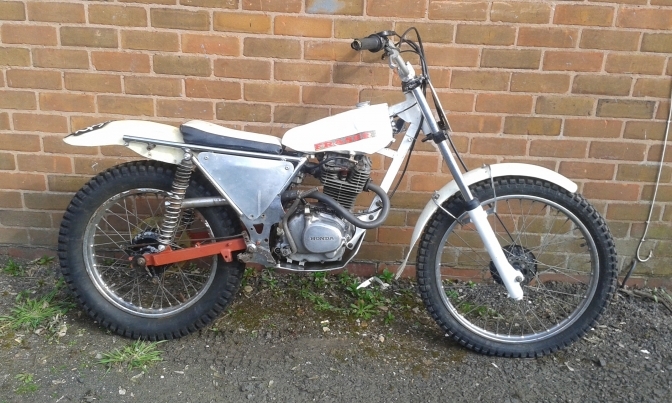 Hi Charlie, reading your page relating to Fraser Honda, here is my HT250, I rescued it about five years back, it had been used as a donor to build another which was for sale on twinshock shop web page for some time, that makes four HT250 bikes that still survive, now back in the Midlands not far from where it was made, thank you for all your hard work that's been put in your site, I use it regular for trials bike info, and a good friend of Dave wood. Charlie Oo> Thanks John another good find and thanks for your kind word, it is you guy's that keeping finding me New information, and machines.that keep the site interesting. and recording the history of the unrecorded at the time. 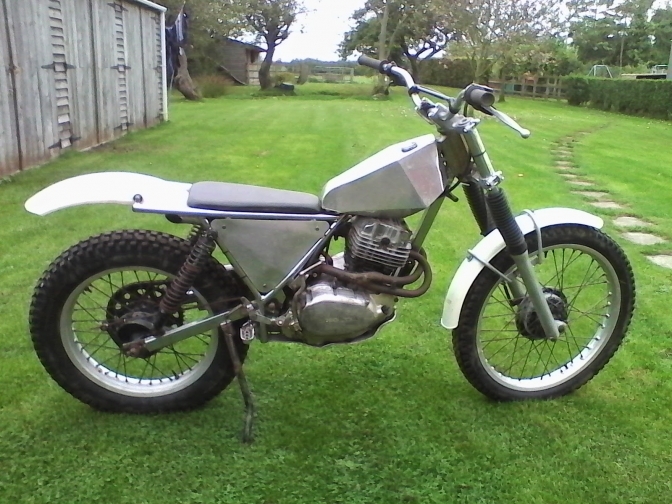 Johns HT250, Photo Courtesy John Dodsworth. This one from the North of England, and looks like a bigger engined machine. 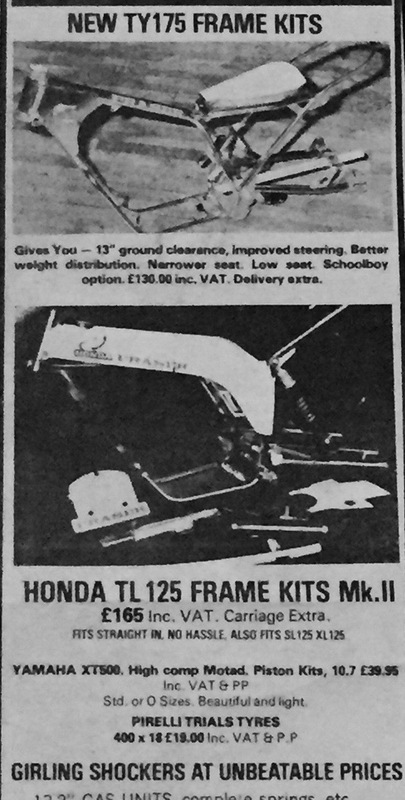 And then Colin bought a batch of frames from DMW and fitted Honda, and Villiers engines into them. This I still can't quite understand, was he thinking beyond the box at this time or just in trouble with the company. you decide. I just don't like this machine. A Step To Far, and why buy the frames?? We have a advertisement from a T-MX sent to us to use by Alan J. Here you can see the MK2 kits clearly for sale for fitting the popular TL and CG Honda engines. The second frame is one of these, and owned by Alan J ,we hope to see this and the other frames built into machines Alan. 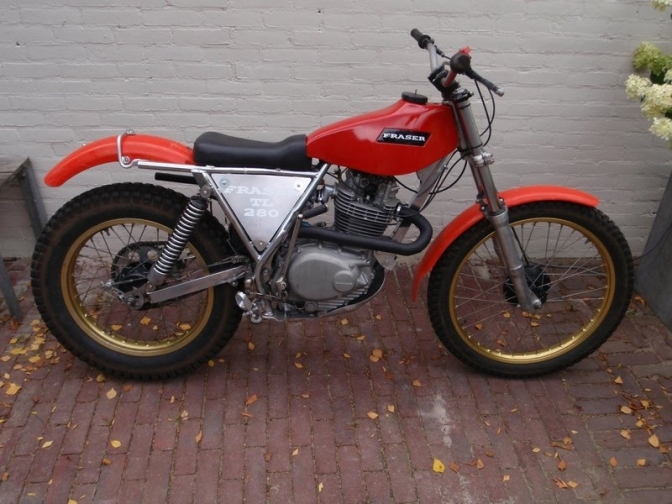 This bike seems to be one of the famous 280's. Another Fraser Honda I have found on my computer stock, so don't know who's it is? 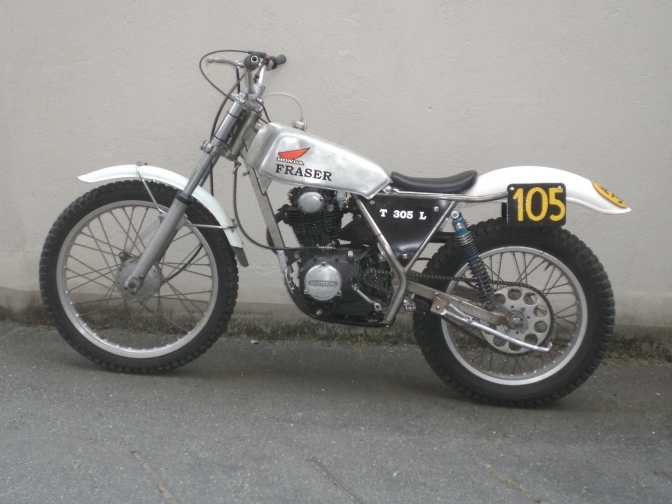 Here is a better example of one of the twenty DMW framed "Fraser" Honda's. We get a big break through from Justyn. New Frame for TL125 Honda. 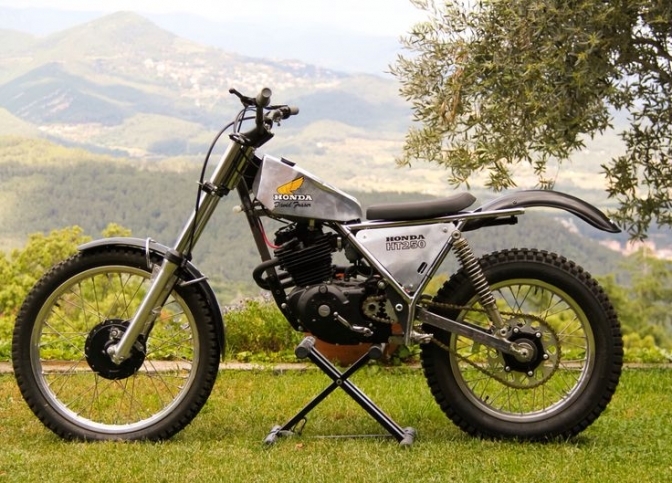 Following a year of development by Midlands Centre trials rider Colin Tipping, a lightweight trials frame kit to except a Honda TL 125engine front forks and wheels is to be manufactured by a Redditch company David Fraser Products. Essence of the design are top and seat tubes of 2 1/8” diameter affording a rigid beam from which the engine is to be hung The pivoted rear fork is constructed from 1 ½”X ¾” RHS tubing. 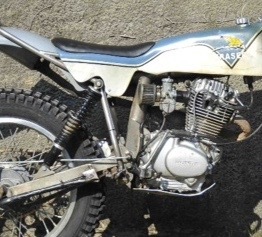 The complete Fraser Honda kit comprises of the frame and rear swinging arm Girling rear shocks side stand brake pedal, and sump under shield. , Plus a glass-fibre tank and seat unit with alloy internal tank. 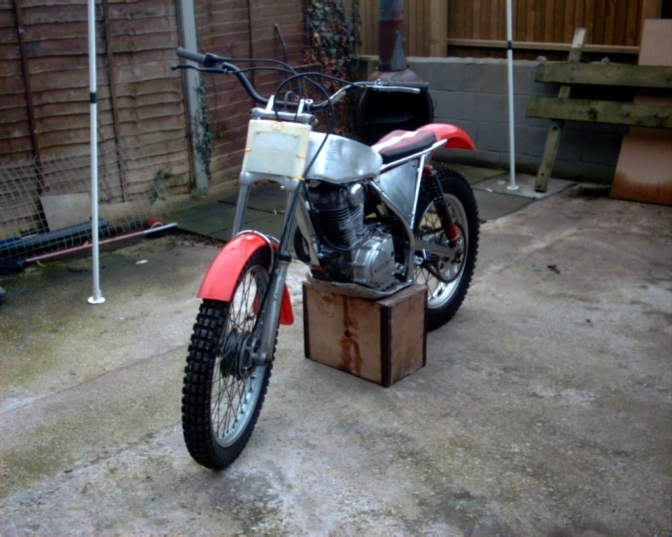 A Complete exhaust system air filter box, with foam filter, chain tensioner, rear chain guard rear mudguard and front competition plate. Frame and forks are Nickel plated in Reddiitch, and the tank-seat unit is white and yellow gelcoat finish. The first frame kit of the initial batch is earmarked for Coventry rider Dave Hammersley. who is to be sponsored by Frettons . The manufacturers claim that the complete machine will weigh around 170lbs. 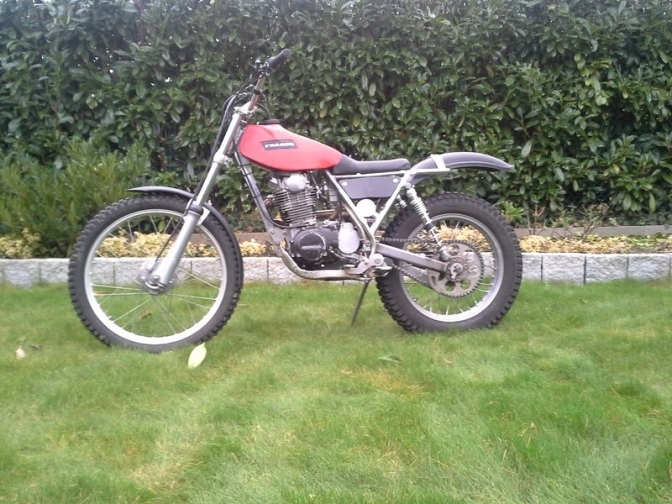 as compared with the standard 125Tl at 224 lbs. 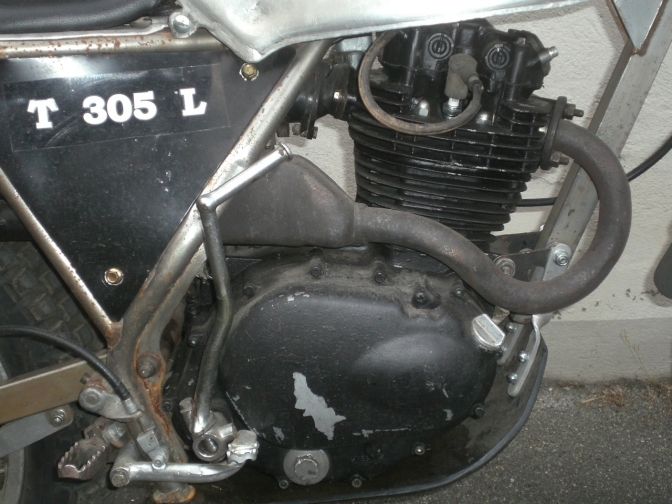 The steering head angle is shallower than the TL, so the complete front TL forks and wheel can be used. Without using special angled yokes. Colin tipping said the wheelbase has been extended by 1” mainly to move the engine back for a better position and to provide more room between the footrests and bars and to make a better riding position with more room. Ground clearance on the machine is increased to 12 ½”. 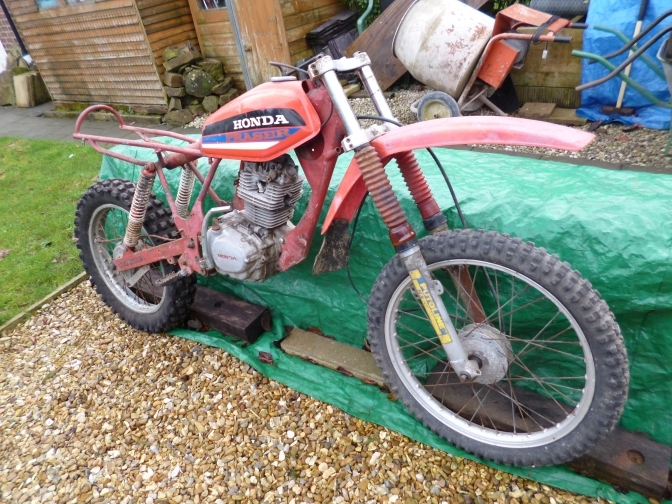 There are now so many Honda engine conversions on the market boosting the TL 125 to 10 175 or even 220. That we felt it was time a decent frame was available. 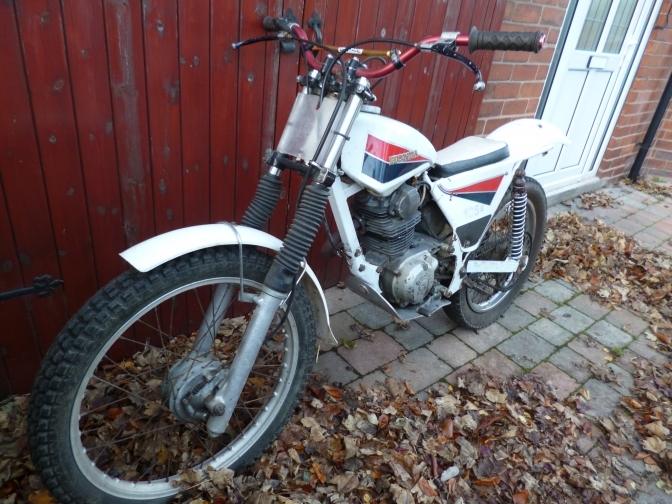 So that the average rider could begin to treat a Honda as a serious trials tool. 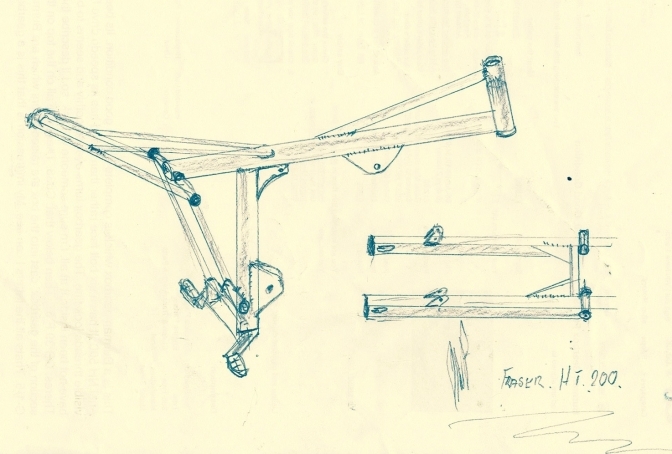 Steve Wilson will be assisting us with frame construction, and plans for the future include an enduro frame. Different design as we can see from Steve’s photo of his machine. But retaining the backbone principle. That frame is to take the Honda SL and TL 125 cc engines. 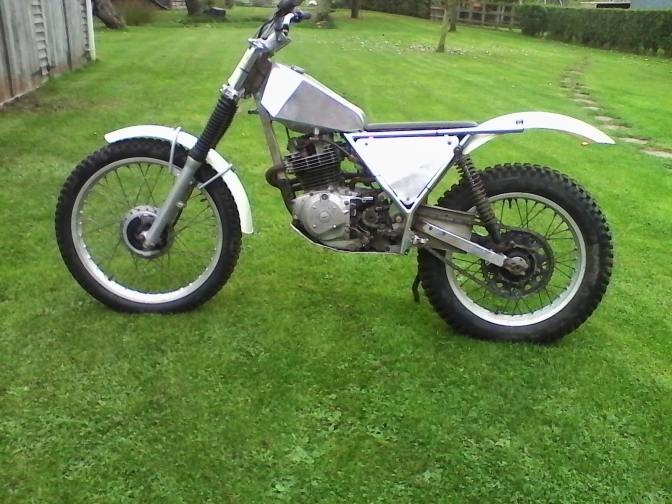 And a further enduro frame for a Yamaha DT 175 250 and 400cc tailbike engine. Makers are David Fraser Products Unit 32T Heming Road Washford Heath Industrial Estate Redditch Worcs. 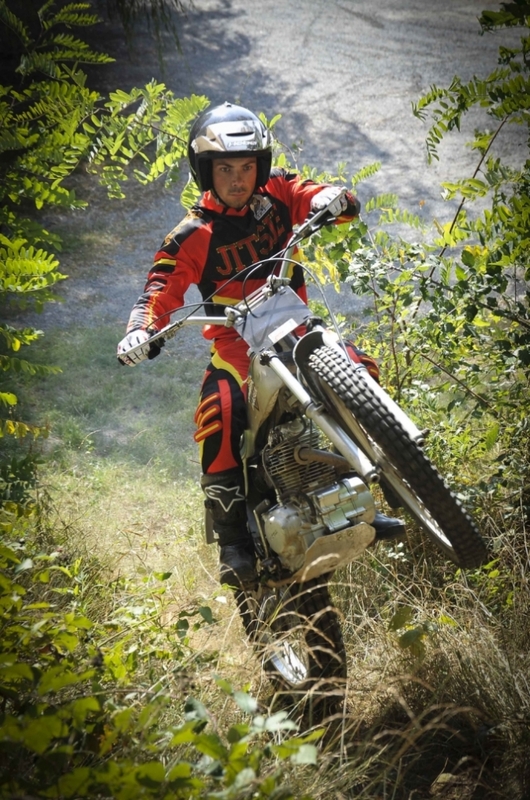 Photo Courtesy Deryk Wylde, Historic Offroad Motorcycles. 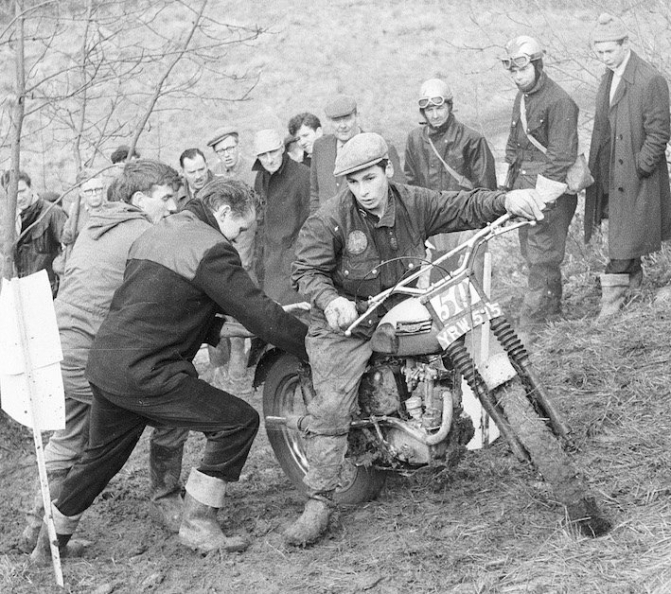 Here Is Coventry's Dave Hammersley being helped on "Camp" section in the Cotswold's, a while before he got the ride on the Fraser Honda. I have been asked to remove it because it is allegedly the property of A French Honda motorcycle club. And they don't want the History of a British built machine , placing on a public domain. So I have typed my own version until I can lay my hand on the news paper article. They also wanted the photo taken from that paper removed also. So here is my sketch of the frame for you. This is now my © how childish . some people are. and I did not expect that from a respected trials club. We can now explore the Steve Wilson road, to get more information about the Fraser breed. 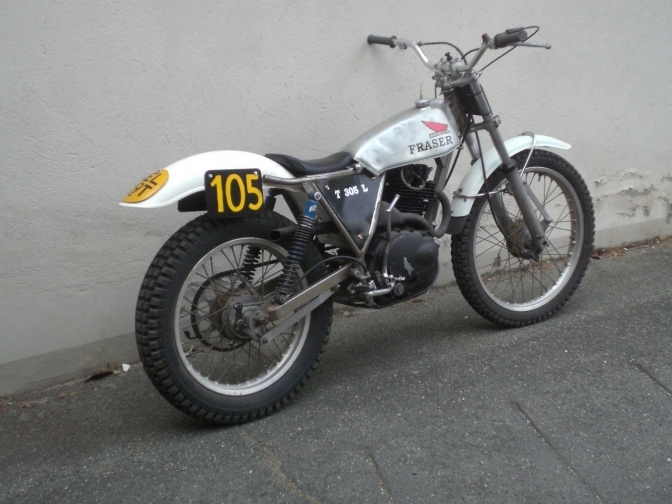 This is Justyn's "Fraser HT 200" Honda. As a Courtesy to Justyn. One of the Fraser Honda's with shall we say "Otter" type frames ( The HT 200)at a Classic bike show. could be Stoneleigh ? Merry Christmas to you all also, and the Fraser in question was bought by me early this year 2017. I took on the challenge. 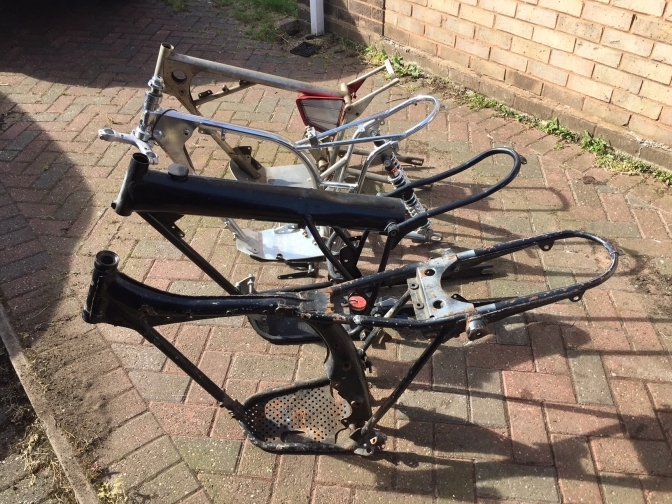 The bike is under full restoration at the moment but as it was mostly there I have only needed to sort out various parts to complete the restoration, and soon I hope it will be complete and ready to use or show. 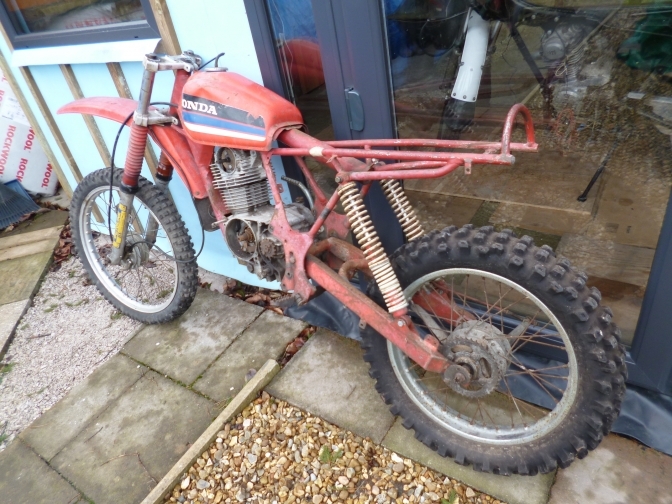 As you might be able to see, the bike had had a hard life, and the original alloy tank was badly dented, this has been cut open and reshaped to as new condition, as has the frame, and the wheels have been rebuilt with new tyres fitted. And the engine has been refreshed. Very Best Regards, Paul Davies. And One from Linden Thorpe. 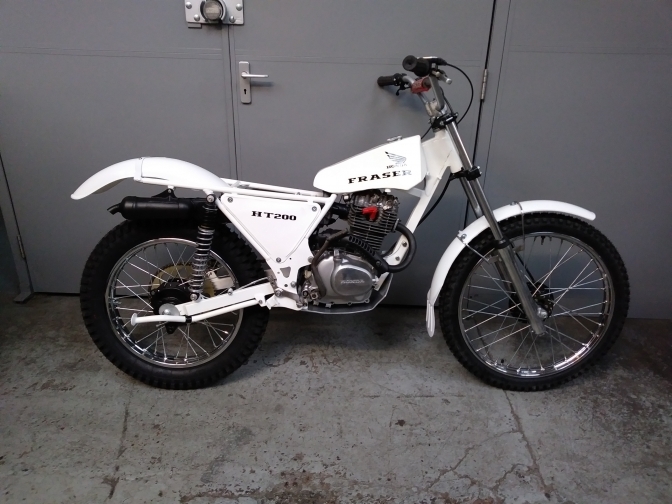 I've been speaking to Paul Davies as we have the same model Fraser HT200 from the early 80's so thought I would share the photos of my project. So this is two of this particular model we know of, anyone know of any others? We keep finding these bikes don't we, were there more the was first thought ? or have most of the build bikes survived? I like the brake pedal arangment on this bike, and this is the same set up as I need for the Jialing wheels I have. 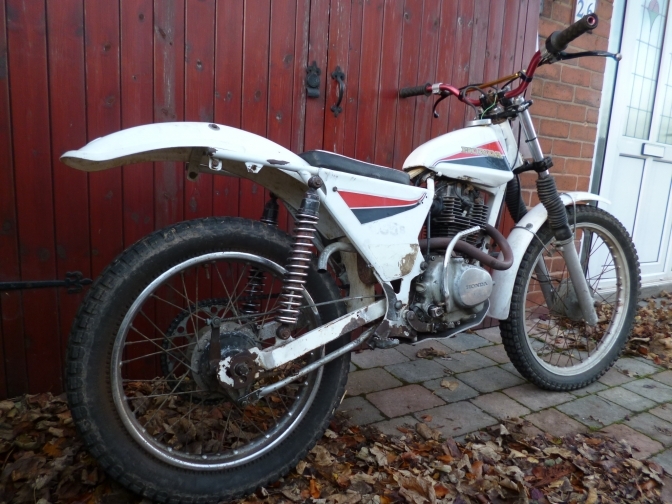 I see in the article sent in by Justyn that Fraser had plans to develop an enduro version with the aid of Steve Wilson so here are photos of my Fraser Enduro project. Anyone seen another? or know how to get in touch with Steve Wilson? did he end up down in Cornwall? It Now seems the appropriate time to try and find Steve Wilson. for I am sure he can help us with information on the Fraser Brand, as well-as the ELstar. 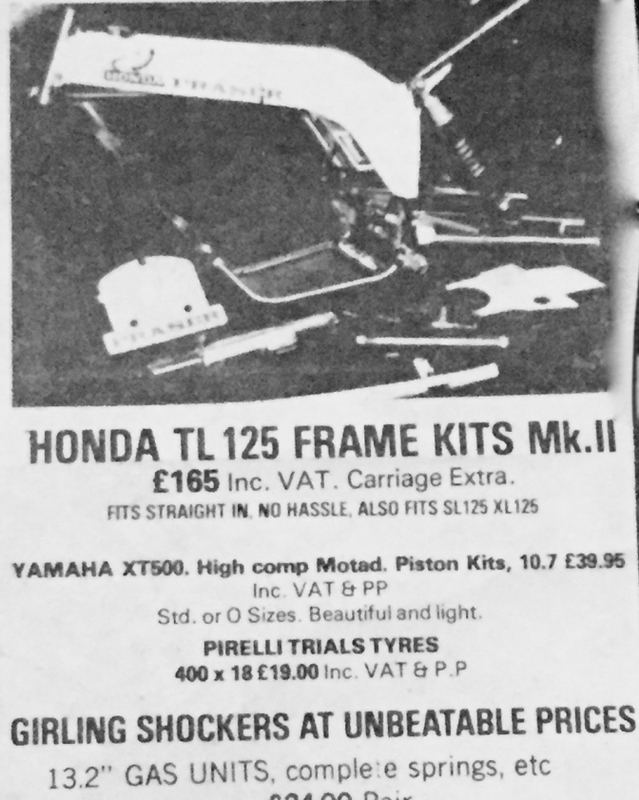 There was also a Yamaha frame kit built by Fraser because here is the advertisment. And we will get More Later.